Fish skins for a treat? You’re kidding me right? I mean where’s the beef? 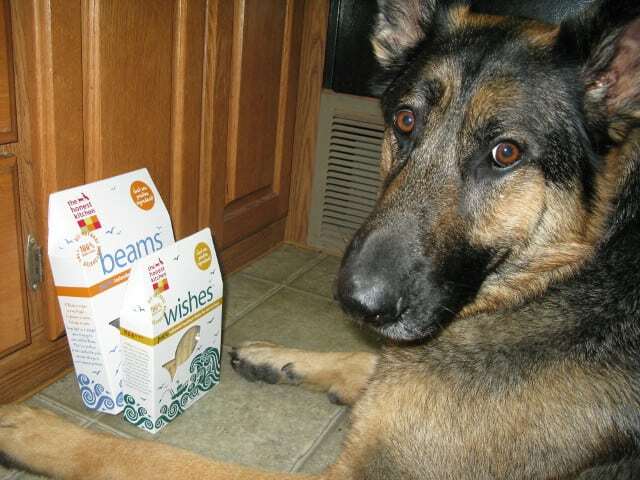 Well, Honest Kitchen sez Beams and Wishes fish treats are tasty and good fer you, so they sent me some to try. As the Tripawds Spokesdawg, I feel it’s my duty to tell you if fish is really all that. Momma sez I have too many treat bags open right now so I gotta wait. Honest Kitchen Wishes Grain-Free Dog & Cat Treats are suitable for both cats and dogs, and can be used as a general reward or aid to training. Wishes are made with 100% wild caught Haddock from Iceland using sustainable fishing practices. Iceland places a strong emphasis on the protection of its marine habitats and manages the waters off its coasts to prevent over-fishing. Icelandic haddock stocks have risen dramatically in the past 5 years. They’re grain-free, delicious and perfect for sensitive pets who suffer from allergies or intolerance to certain foods such as grains and proteins. Honest Kitchen Wishes Grain-Free Dog & Cat Treats come in large, dehydrated fillets – they can be snapped into smaller pieces for your dogs or cats. Ingredients: 100% human-grade, wild caught Icelandic Haddock. 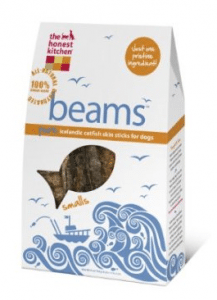 Just one healthy, pristine ingredient…..Honest Kitchen Beams Dog Treats are made from pure, wild-caught Atlantic Catfish* skins, from the clean ocean waters of Iceland, dried into savory, chewy sticks. They’re guaranteed to satisfy the pickiest of pups and are the perfect treat alternative to dried chicken snacks or bully sticks! Beams are an excellent source of lean protein, they’re also lower fat and are a good source of Omega 3 Essential Fatty Acids. Fish is an excellent treat for dogs who have sensitivities to more common protein sources. Beams Smalls are about 7 inches and have 26 calories per treat. Beams Talls are about 12 inches and have 39 calories per treat. offset the costs of maintaining our community.